Carte De L'Empire De Russie, En Europe Et En Asie. 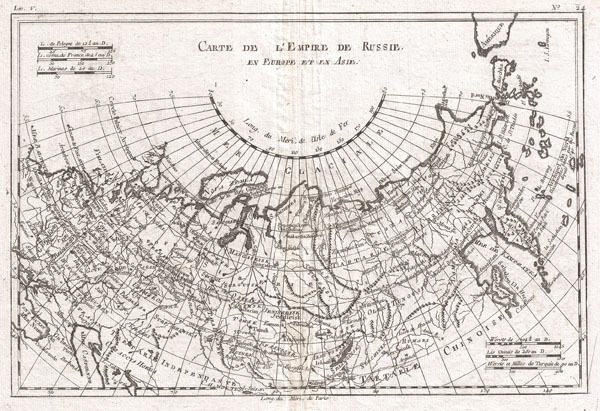 A fine example of Rigobert Bonne and Guillaume Raynal's 1780 map of the Russian Empire. Shows entire Russian Empire stretching from Europe to the Behring Strait, as well as parts of Eastern Europe and Tartary. Cartographically the Northeast coast of Russia is quite accurate though adjacent lands in the Americas are speculative a best. A number of mysterious islands are named, likely a very early perspective on the Aleutian Archipelago. Highly detailed, showing towns, rivers, some topographical features, important roadways and political boundaries. Drawn by R. Bonne for G. Raynal's Atlas de Toutes les Parties Connues du Globe Terrestre, Dressé pour l'Histoire Philosophique et Politique des Établissemens et du Commerce des Européens dans les Deux Indes.